Click on the map to look where we are located. We have horses available for trail rides and jumping. You can take long nature rides along Gauja River. Instructors and saddles (English and Western) are provided. We offer one-week camps, where you can learn how to look after a horse and how to ride. If you have your own horse, we can accommodate horse and rider. 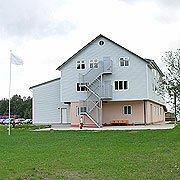 We run camps for children and young people from June to August. As a rule, these camps last six days (from Monday through Saturday). Each child is placed with seven children his own age and one counsellor. The program includes Bible teaching, games, music, and sports. Call us to register your child or yourself +371 26349339. The easiest way to relax in Ganchauskas is to come and stay for a few days. You will enjoy the same amenities, but you are free to organize your own program. 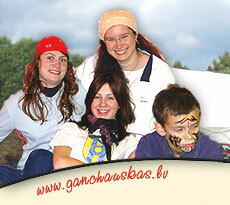 Here, in Camp Ganchauskas, in the great outdoors, is the ideal place to hold nature seminars. Comfortable lodging, good food, classrooms with all the necessary equipment, and surrounded by the beauty of God's creation – what more could you want?